A good historical fiction novel will make you feel like you’ve been taken back in time, like you can experience events long in the past. But what creates that feeling for the reader is often a lot of hard work by the author! 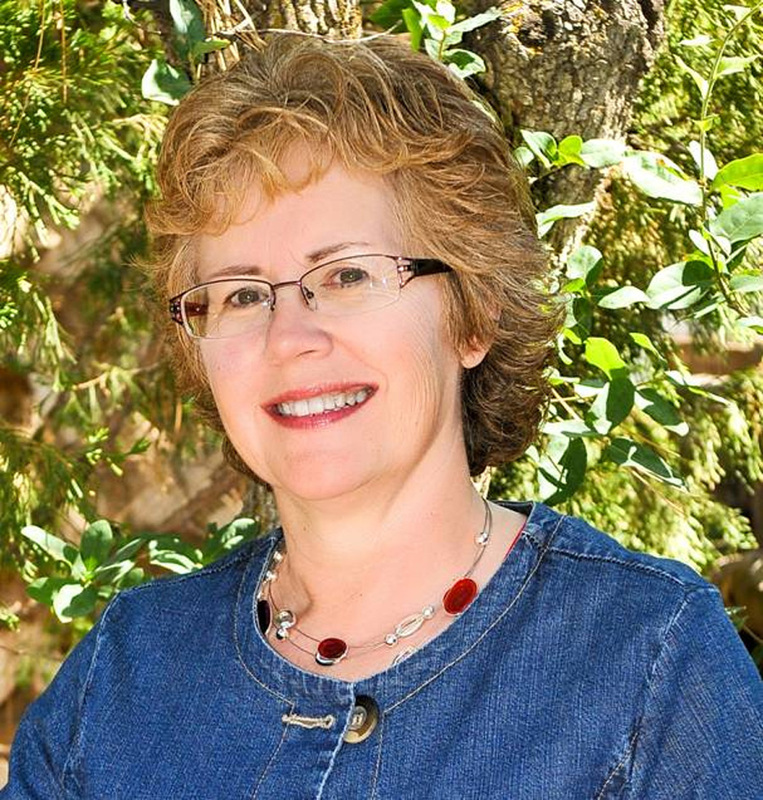 Amy Green (Bethany House’s fiction publicist) here, and today on the blog I’m interviewing Carol Cox, who loves the research process and bringing history to life through her novels. Her newest release is Truth Be Told, and she’ll share some behind-the-scenes information about it with us. Amy: Tell us a little about the setting of Truth Be Told. 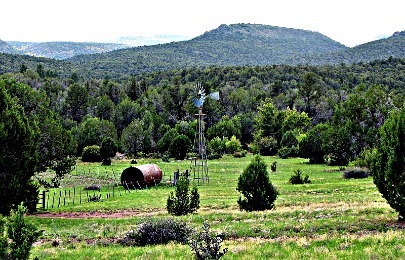 Carol: Truth Be Told is set in the fictional town of Granite Springs, located in the highlands of central Arizona—one of my favorite places in the state. The variety seen in the landscape is stunning—everything from rolling ranchland to dense cedar thickets to pine-covered slopes. The area also has a rich history of mining, ranching, and lumber operations, all of which are woven into the tapestry of the story. 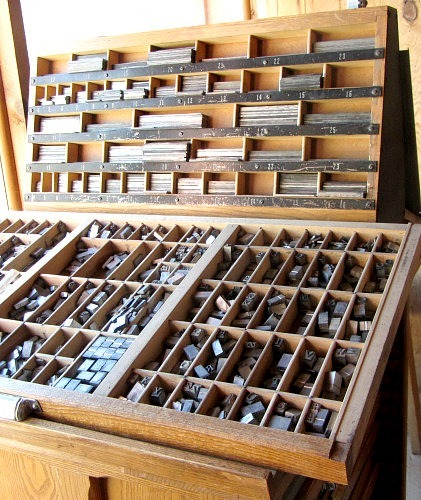 Since Amelia takes over running her father’s weekly newspaper upon his unexpected death, many of the scenes in the book take place in the printing office of the Granite Springs Gazette. Learning about operating a frontier newspaper in 19th century Arizona was a fascinating experience, and I loved being able to use that research to give the story authenticity. The landscape that inspired the setting of Granite Springs. Amy: Speaking of research, as a writer of historical fiction, what would you say are your three most important resources? The library—and my own collection of reference books—are often the first places I turn to when I begin my research. I also do a lot of searching online, being careful to make sure the sources I use are accurate. Sharlot Hall Museum, located in Prescott, is a treasure trove of information on Arizona history. And for Truth Be Told, I was thrilled to be able to learn about the operations of a 19th-century newspaper and the process of printing on a Washington Hand Press from Sky Shipley, owner of Skyline Type Foundry. Amy: You are at a writers’ conference and an aspiring author sits down next to you and asks, “How can I make my historical setting come alive for modern readers?” How would you answer? I try to gather as many details about the setting as I can from as many sources as I can locate. And if making a trip to the site is feasible, so much the better! I love being able to experience the “feel” of a place for myself. Onsite research lets me soak up the setting’s atmosphere and gives me a host of sensory details I can weave into a story to make the reading experience richer and more immediate for my readers. A type cabinet: note the number of pieces sorted in cases. Whether I visit the setting in person or not, I’ll spend time putting myself in the minds of my characters, imagining what they would see and feel. Books or online research may tell me the streets would be illuminated by gaslight, for instance. But what kind of glow would my characters see from those gas lamps? Would there be pockets of darkness between the lamps (and if so, would danger lurk there)? What sounds would my character hear on an evening stroll through town—the clip-clop of horses’ hooves on a dusty Western street? The heels of cowboy boots thudding along a boardwalk? Digging for details like that not only make for a richer texture overall, but can open up exciting possibilities for story events! Amy: Are any of the places and characters in Truth Be Told based on fact? Most of the book is based purely on my imagination, but I enjoyed slipping in a few actual sites and people from Arizona history. The Eleventh Infantry Band, which performs for the citizens of Granite Springs, was stationed at nearby Fort Whipple, and was directed by Achille LaGuardia, just as we see in the story. If the name LaGuardia sounds familiar, you may be thinking of Achille’s son, Fiorello, who spent some of his childhood years at Fort Whipple before growing up to become the well-known mayor of New York City. The Hotel Burke, where Ben Stone stays during his visit to Prescott, was the original name of the present-day Hotel St. Michael, which stands on the corner of Gurley and Montezuma, across the street from the Courthouse Plaza. I’ve enjoyed a number of meals in the hotel’s dining room, which offers a marvelous view of downtown Prescott. Amy: Here are a few quick ones just for fun. Carol, fill in the blanks! If I could travel in a time machine, the first place/time I’d visit is… sometime at the end of the 19th century or the very beginning of the 20th. Big changes were taking place in technology, and there was a surge of excitement about the future and the wonders it might hold, along with a sense of optimism and patriotism that often seems lacking today. I would love to witness that firsthand! A style from the 1800s that I’d like to bring back is…those gored skirts with the fullness in the back and the full-sleeved, long-waisted bodices. Fashions for women were becoming less restrictive and far more practical. And bustles were a thing of the past, thank goodness! 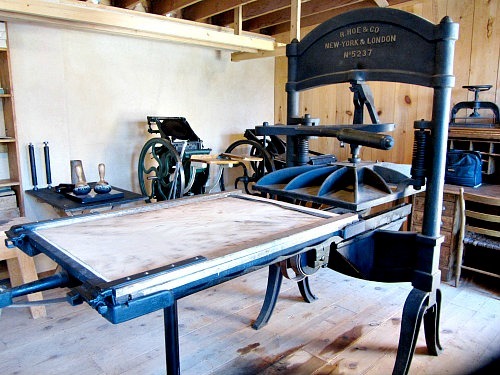 A Washington Hand Press, just like the one Amelia used, from the Print Shop at Sharlot Hall Museum. My least favorite part of the research process is…having to pull myself away from the research to start writing! A “fun fact” I discovered while researching this novel is…before I started writing Truth Be Told, I was aware that all the type for the stories printed in a newspaper had to be set by hand, but I never took time to think about how many individual pieces of type would be involved in one issue of a four-page weekly. The sheer numbers were staggering! Thousands of pieces of type would have to be set in place each week. And it never occurred to me that every single one of those pieces would have to be sorted back into their places in the type case once the paper was printed. Distributing and redistributing the type was a never-ending process. May I just say how grateful I am for the word processing program on my laptop? To get to know Carol a little better, stop by her website or like her author Facebook page! This entry was posted in Thoughtful Thursday and tagged Carol Cox. Bookmark the permalink.